Beelink has announced three new devices based on Intel Atom Z3735F processor: Pocket P1 slim PC, Pocket P2 HDMI stick, and a mini PC simply called “Mini PC” with an internal slot for 2.5″ hard drives. All three mini computers come with 2GB RAM, 16 to 32GB eMMC, and run Windows 8.1 like most other Z3735F devices, but they’re also providing dual band Wi-Fi and Bluetooth 4.0, USB 3.0 ports, and for the mini PC a Gigabit Ethernet port. Mini PC – 4x USB port + 1x micro USB OTG port. USB 3.0 is mentioned but, It’s unclear whether all four ports are USB 3.0, or there’s a mix of USB 2.0 and USB 3.0 ports. Interfaces like USB 3.0, Gigabit Ethernet and SATA are nice, but the way they are implemented are important, or they may just be marketing tricks. 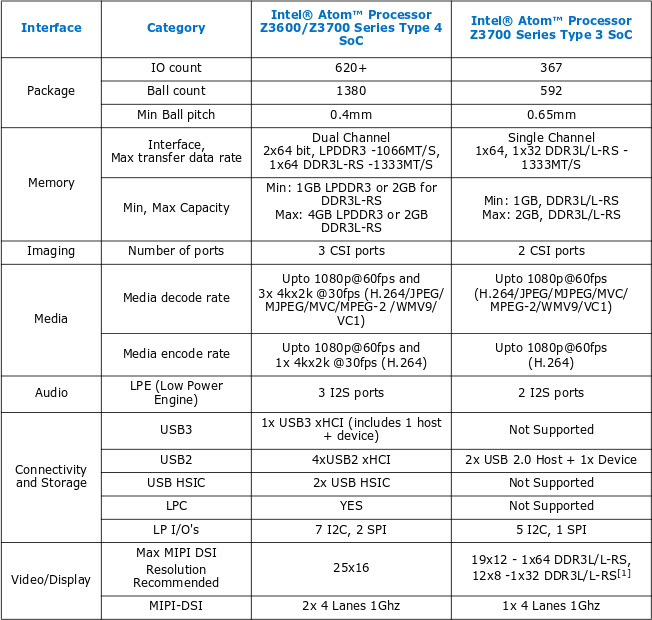 So I’ve extracted the table from Intel Atom Z3600 / Z3700 datasheet to check out the capabilities of the SoC. There are two type of Soc Type 4 and Type 4. According to the datasheet: “Z3735D, Z3735E are in Type 4 Package” and “Z3735F, Z3735G, Z3736F, Z3736G are in Type 3 Package”. So based on this information and other parts of the datasheet, Z3735F should not support USB 3.0, has no Ethernet interface (let alone Gigabit), and SATA is nowhere to be found. That would means SATA and Gigabit Ethernet are both going through a USB host interface limited to 480 Mbps. I’m not quite sure how USB 3.0 can be implemented, unless that means they just used the blue USB 3.0 connectors only. Having said, Mele PCG03, also based on Z3735F, is perfectly capable of decoding 4K / H.264 up to 30 fps, so I wonder what if the datasheet could be wrong, or there are different versions of Z3735F. Assuming the company is actually using a type 4 SoC, then USB 3.0 would be natively supported, and Gigabit Ethernet and SATA could either be implemented via separate USB 2.0 interfaces, or through an on-board USB 3.0 hub, and both cases are not ideal. 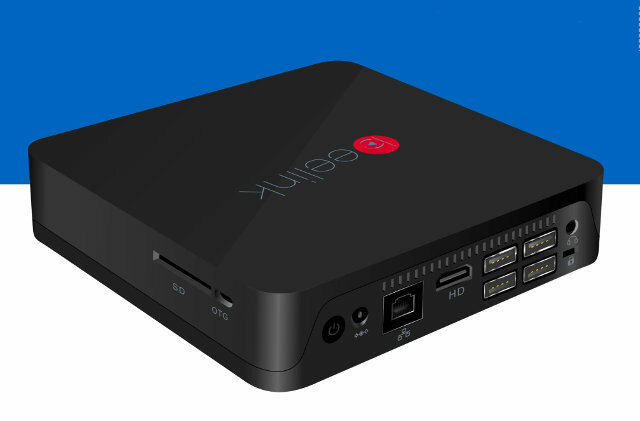 Nevertheless, we should not expect amazing SATA and Gigabit Ethernet performance out of Beelink Mini PC. USB 3.0 remains a question mark, but it’s likely they’ll use a Type 4 SoC, so performance should be very good (in theory). Availability and pricing information is not available at this stage. Anyone know how is Bay Trail in Linux supported? I’ve tried the Ubuntu 14.10 Mate image, and as others mentioned audio is not working. The system does not detect any audio devices. Otherwise if you don’t need sound or Bluetooth, it works OK, even for video decoding in Kodi. A workaround to get audio is to connect a USB sound card. So, these Atoms don’t have any PCI Express capabilities, whatsoever? Type 3 & 4 SOCs – are they *trying* to confuse people? No mention of PCI Express at all in the datasheet. …Intel Baytrail-based audio devices… ? I have not looked into it in details yet. There are differences between Bay Trail devices, so it’s not 100% sure the changes will apply to Z3735/6. A months ago, i read that z3735f/g only support turbo 1.8ghz in 2 cores simultaneous, but z3735d/e have turbo 1.8ghz in all 4 cores. But, i can’t found the post right now. And P1, just not the MiniPC which might be worth getting!! I have tried to do the same but it seems that something is wrong with the UEFI and cannot boot to Ubuntu.